QUICK INSTALLATION-NO SCREWS, NO DRILLING, NO MESSY ADD-ON ADHESIVES: Attaches in seconds! Just peel the paper off the pre-applied adhesive strip and attach to your window or glass door. No mechanical skills required! PREMIUM QUALITY MATERIALS: Made of super strong polycarbonate for exceptional durability. Comes with pre-applied heavy-duty CLEAR industrial strength 3M VHB tape. Mounts securely to glass and mirrored surfaces. Totally clear styling blends easily in any room. EASY TO USE: Simple sliding motion locks and releases. YOUR CHILDS SAFETY IS FIRST AND OUR #1 PRIORITY: We know you put your baby's safety at the top of your list and we do too! 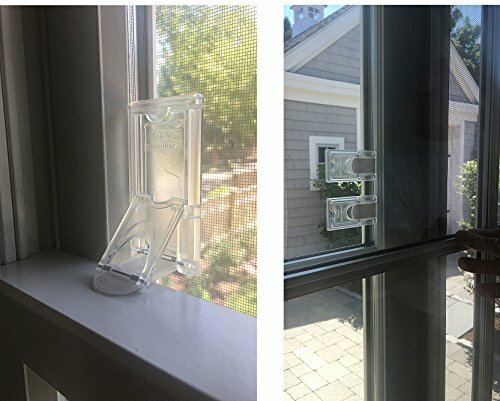 Our Safety Innovations Window and Door Safety Stop helps keeps windows, sliding glass doors, sliding shower doors and mirrored sliding closet doors locked to keep curious kids safe from window falls and from exploring unsafe areas. WE RECOMMEND USING 2 LOCKS ON EACH DOOR OR WINDOW FOR ADDED SAFETY: Be proactive! Keep your windows or sliding glass doors locked so your baby is safe and secure.